Living in Argentina has taught me many things. I learned how to teach English, how to speak Spanish, how to navigate a socialized medical system as an illegal immigrant….but the best thing I’ve learned in Argentina is how to cook. Back home I cooked often, but it was a totally different game. All foods come pre packaged and microwave ready. You can survive so easily in the States without any culinary knowledge beyond the defrost button on your microwave. (Especially with a Whole Foods right down the street!) This is not the case in Buenos Aires. There are some ready made foods – but nothing worth eating. Your options are some raw ingredients and a few spices. And I can proudly say that I ‘made it work’! 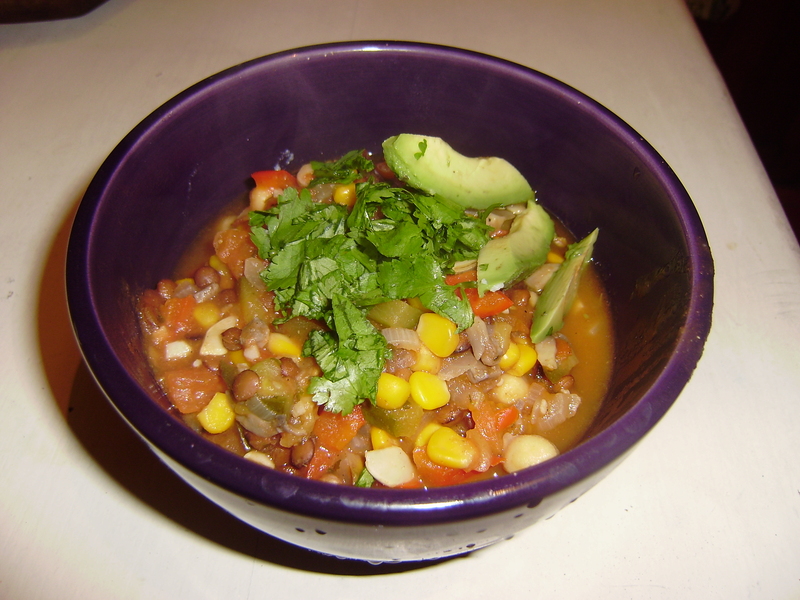 My latest cooking experiment was a vegetarian chili. 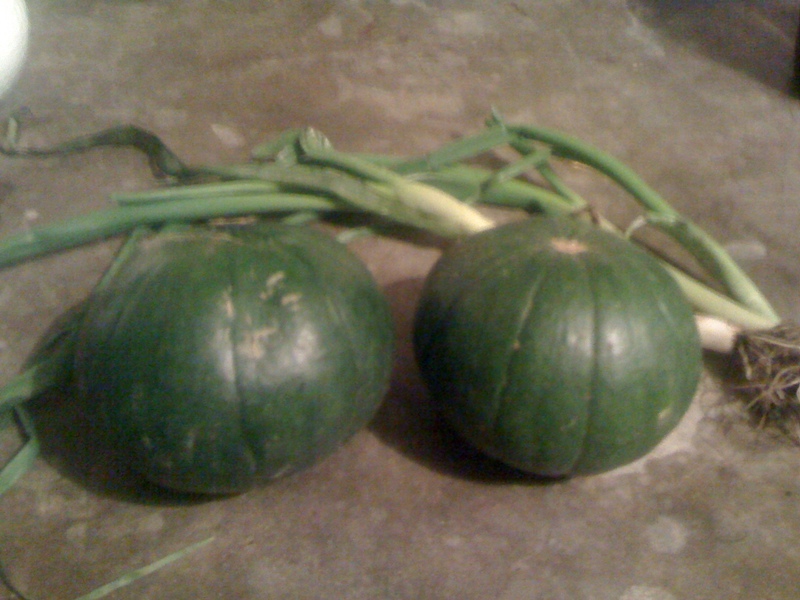 It was a drizzly dark evening, and even though it is springtime, my psyche is hardwired to associate October with wonderful Autumn harvest foods. Like a hot bowl of chili to be specific. Well it turns out that chili is the easiest thing in the world to cook, and it is super delicious and rather hard to mess up. My ideal recipe, and vegetarian to boot! Yay! I modified Emeril’s recipe to make my own, since I had never before made chili. Very happy with the results, thanks Emeril. Basically all you have to do is chop up some vegetables. I chose red peppers, onions, a zapallito, mushrooms and corn. Then add some diced tomatoes, water, spices and tomato sauce. For spices I used black peppers, salt, oregano and cumin. It was very flavorful. 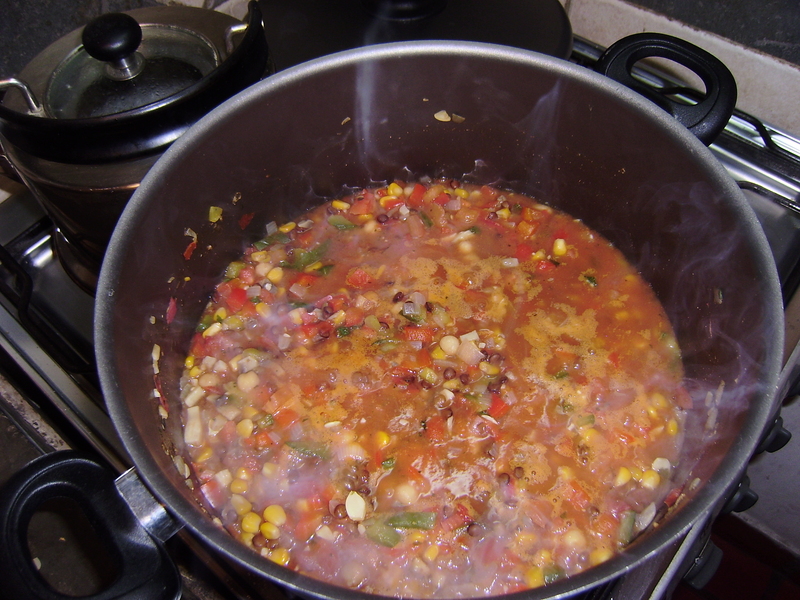 Then you cook it on the stove for … as long as you want, and add some beans. I chose lentils and garbanzos. Delicious. Bam! Garnished with fresh cilantro and some avocado. 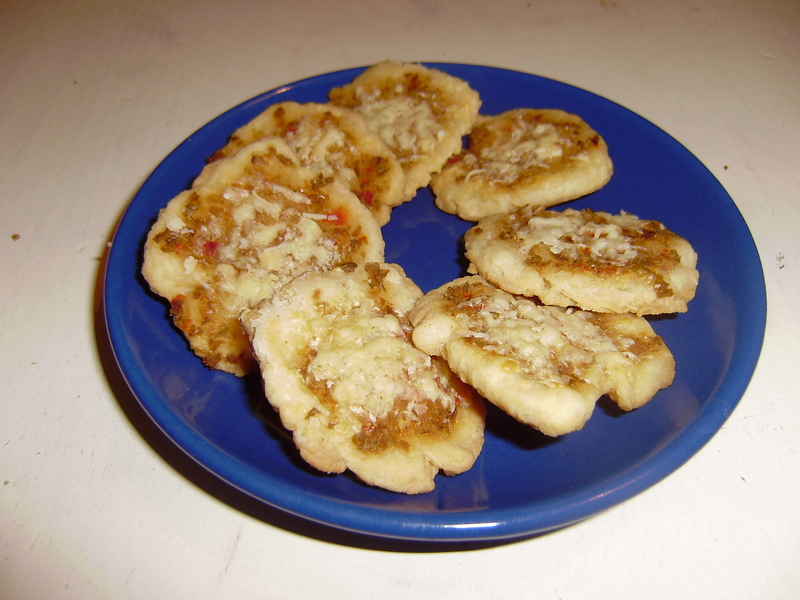 I served the chili some homemade crackers – my elementary attempt at baking. Using the simplest recipe of flour, milk and oil, I made some dough and then topped with olive tapenade and a little parmesan and baked in the oven until crispy. They were great. Not the cutest, but tasty. The best part? Leftovers! Time for lunch. I enjoyed cooking and baking before I moved to Argentina, but I absolutely agree that living here will make a cook out of you (unless, that is, you’re content with subsisting on empanadas, pre-pizzas and sandwiches de miga). I’ve learned to make so many foods from scratch that before I just plucked off the supermarket shelves. Your vegetarian chili looks very hearty. 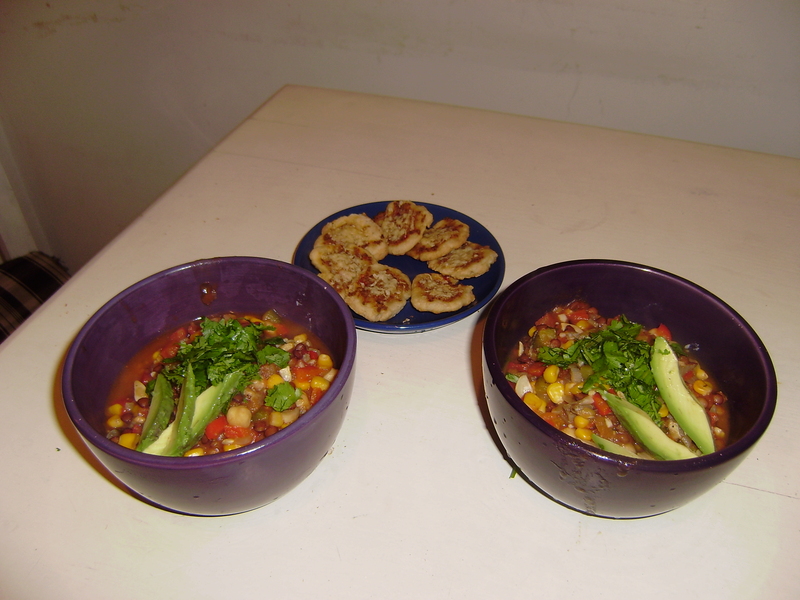 I make beef and bean chili quite often in the colder months, and I usually accompany it with cornbread. I like your idea of parmesan crackers, though. I think I’ll try that.